Many members of our Nutrition Services Team were honored at this week's board of education meeting. On Monday evening at our board of education meeting we had the opportunity to honor some folks connected to our Nutritional Services Team. We did this because of the great work they are doing, which led to a spotless review by the Colorado Department of Education. Included in their recognition were Nutritional Services staff members Heather Williams, Becky Sciola, Alicia Camacho, Roxanne Shinaut, Rhonda Gilliom, and Maluz Brazil. We also honored custodians Jason Jones and Abe England for their contributions to the food service programs at Washington Elementary and Lincoln School of Science and Technology. This week I want to congratulate Cañon City High School wrestling coach Duff Seaney and his staff for qualifying 9 wrestlers for this year’s state wrestling tournament. Duff has had a strong program for many years and this group of wrestlers is every bit as tough as most. CCMS teachers participate in a learning walk early last week. 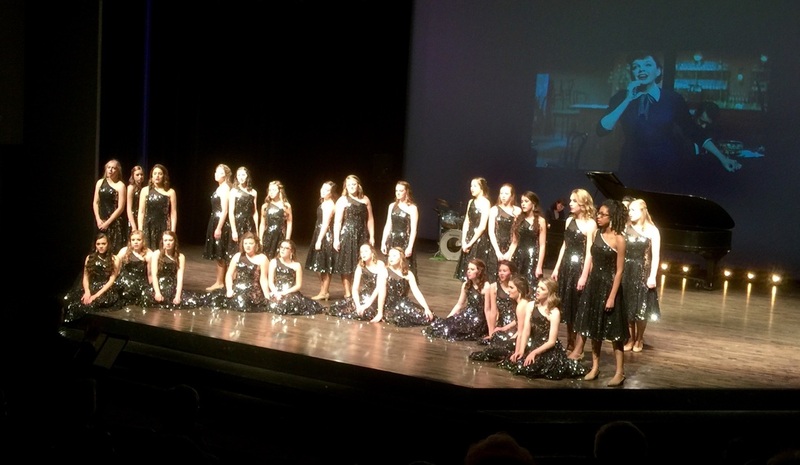 I would be absolutely remiss if I let this week go by without offering a shout out of thanks and respect to Mr. Todd Albrecht, Cañon City High School’s legendary show choir director. 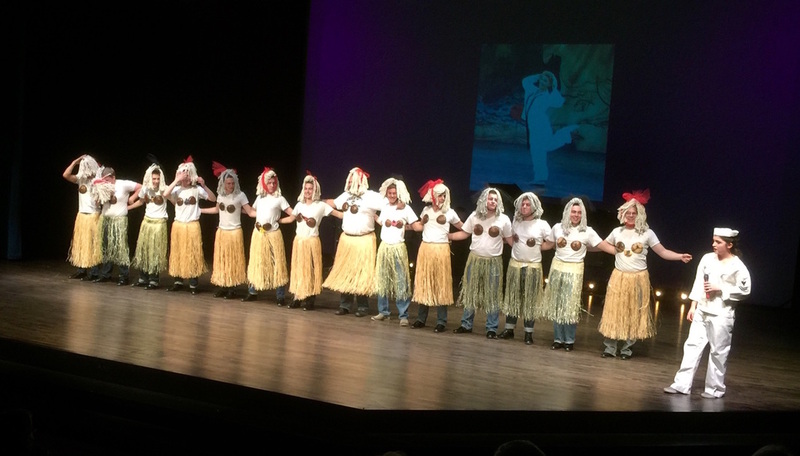 Mr. Albrecht was in the midst of preparations for his annual Valentines Day program fundraising dinner and show when he became ill, and yet he somehow soldiered through his sickness to guide his students in putting on two absolutely wonderful performances this past weekend. My wife Becky and I attended the Sunday evening show and were simply amazed at the quality of the performances, most especially the number of talented soloists Mr. Albrecht put on display. I can not understand how there are enough hours in a day for our students to put in the time needed to prepare at the level they perform. Thanks so much Todd, for all your hard work every day, but especially for the way you went above and beyond the call of duty this weekend. I know you did it for your kids! Finally, I want to thank principal Tim Renn and the entire teaching staff at Cañon City Middle School for establishing the practice of conducting learning walks. Mr. Renn does this by taking several teachers into classrooms taught by master teachers who display specific pedagogy he would like to share with the visitors. In dong so, Mr. Renn and the entire CCMS faculty are creating one gigantic professional learning community where teachers are encouraged to learn how to become better at what they do from each other. CCHS principal Bret Meuli discusses student engagement with one of his teachers. This past week we spent a couple of intense days in several of our schools conducting mid-year building reviews. On Wednesday we spent the day in Cañon City High School where we sat in on department meetings, and checked on classroom instruction. While there we saw some amazingly engaging and purposeful lessons being taught, especially in the performing arts and vocational instruction wings. On Thursday we began our day at Cañon City Middle School and were impressed by the preparation principal Tim Renn and dean of students Jesse Oliver put into our visit. We were appreciative of the work being done related to the establishment of professional learning communities, the building’s focus on teacher learning walks, teacher development of high quality learning targets aligned to the curriculum, and the general sense of teamwork that is emerging in the building. We ended our day on Thursday at Harrison K-8 School with principal John Pavlicek and assistant principal Brian Sprenger. While there we appreciated how John and Brian could explain the areas they have focused on as they have begun to adapt to their new leadership roles in the building. We were most impressed with the work John and Brian are doing getting into classrooms in support of improved instruction, evidence presented showing how teachers are making use of the district curriculum to guide instruction, and work being done improving the student behavior plan. We hope to have exit reports in the hands of these principals by the end of next week and will encourage each staff to review them as guidance toward future improvement efforts. CCMS principal Tim Renn and dean of students Jesse Oliver discuss plans for further developing teacher professional learning communities. 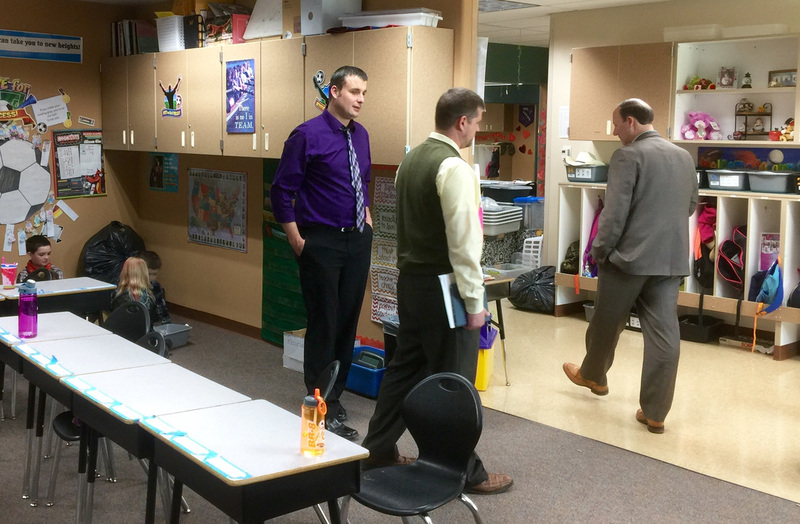 Harrison principal John Pavlicek exits a classroom with director of student services Dominic Carochi and consultant Ted Knight after observing instruction. When not conducting mid-year building reviews and pricing out building projects so we can write the narrative for a BEST grant application, I have spent time presenting how to many of our staff members about how to use our new evaluation calculator. This tool was created just for our district to be used to guide teachers in developing ways to show the effect they are having on student learning as a key component of our annual teacher evaluation process. What I like most about our new tool is the way it provides a visual for teachers to see how their student learning results effect their evaluation rating, while also allowing them the professional courtesy to explore a number of models they might use before settling on one they would like to share with their evaluator. On a final note about the focus of our work, the board of education will be spending time wrapping up the annual superintendent evaluation process. This will allow them to meet with me prior to our February. Mayor Troutman was in attendance at Monday's board of education meeting. On Monday I focused on district health plan matters, a board work session, and our regular board meeting. At the work session we focused our efforts on budgeting, preparing for spring contract negotiations, and conducting the annual superintendent evaluation process. During the meeting I was quite pleased that Mayor Troutman was on hand to offer up ways in which the city and the school district might work together for the benefit of students and citizens. On Tuesday our BEST Task Force committee met about furnishings. We also held Leadership and Calendar Committee meetings on Tuesday afternoon and evening. On Wednesday and Thursday we conducted our CCHS, CCMS, and Harrison mid-year building reviews. On Friday I attended to BEST grant writing tasks. I’ll be in the office for a bit on Monday (President's Day) and Tuesday to work on more BEST grant writing tasks and to complete some mid-year principal evaluations. On Wednesday I present our evaluation calculator to staff members at CES and Lincoln. I do the same at CCMS and Harrison on Thursday. Mid-day Thursday director of student services Dominic Carochi and I will be in Fountain for a meeting about the revised federal education law with staff from Senator Michael Bennet’s office. I have my monthly RE-2 and DHS collaboration meeting on Thursday, as well as some formal mid-year principal evaluation meetings, and a Facilities Corp board meeting.